Board of Education members began a detailed review Friday of the $113.4 million budget proposed by Superintendent of Schools Elliott Landon during a day-long workshop at the Westport Library. 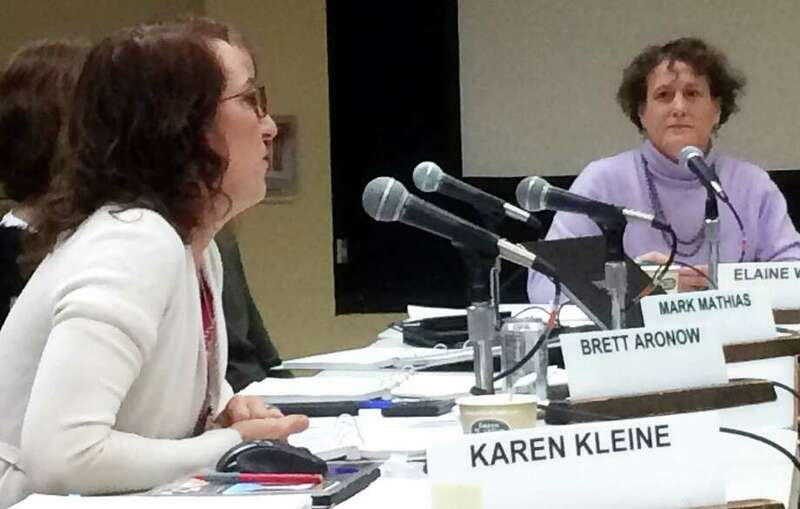 Parents criticized staffing cuts in Superintendent of Schools Elliott Landon’s proposed $113.4 million budget for 2016-17 as Board of Education members on Friday began their review of the spending package at a day-long work session at the Westport Library. Landon, in a spending plan unveiled Tuesday, proposed eliminating stipends totaling $128,355 for all the team leader positions and all the special area liaison positions at the middle school level. He also plans to cut the equivalent of four full-time third-grade paraprofessionals at all five elementary schools, a budget reduction of $108,000. Landon’s overall recommended budget would increase 2 percent over current spending of $111.2 million. The education budget for the new fiscal year, which awaits a final vote by the school board, as well as the Board of Finance and Representative Town Meeting, will take effect July 1. School board member Karen Kleine, a parent of two daughters who attended Coleytown Middle School, expressed support for team leaders. “I’ve had really good experiences with the team leaders with my kids. With team leaders present, if a child was having a hard time at school, they were there to help,” Kleine said. Mark Mathias, a board member, said he wanted to hear from the middle school principals about the proposed cut, and the superintendent agreed to bring them before the board. Lily Bloomingdale explained to the board how, as a parent, she valued the role played by team leaders: “Mrs. Smith, a teacher at Bedford Middle School, knows these students intimately and does a great job at communicating with other team leaders and parents as well. As a parent, I feel more comfortable reaching out to a team leader,” Bloomingdale said. Sue Calger, a parent of four children in the Westport schools, read aloud an email she received from a third-grade teacher about the possible paraprofessional cut. “I know I can speak for my team when I say I would drown without my para(professional), she helps with clerical stuff but also with student support. I know that it may seem like numbers are down, but when you are the only adult in a room with 20-plus students of varying needs all day, you need support. I truly feel that the students would suffer with a cut like that. They are not independent enough at this age to have only one adult all day,” Calger read. Another parent, Christine Kurpiel, opposed the cut in paraprofessional staffing, saying it could result in less supervision of students during lunch and recess periods, posing possible safety concerns.